Syria is hailing China's efforts to ensure security and improve the economic climate in the Middle East, according to Beijing-based Syrian economic observer and analyst specializing in Chinese affairs Munir Gneim. "For our region [Syria] which lacks stability both in terms of politics and economy, the Chinese presence should be assessed in a positive way," Gneim told Sputnik Arabic. "Beijing is interested in stabilizing our region, and it will build strategic economic relations." The analyst pointed out that China has always given special emphasis to Syria due to the country's important geopolitical location in the region. According to Gneim, Beijing regards the legitimate Syrian government as a reliable and long-term partner. For his part, Professor Vladimir Kolotov, director of the Ho Chi Minh Institute of Saint Petersburg National University, believes that China has begun a "great game" in the Middle East. "[Beijing] proposes joining to its great Belt and Road project," Kolotov said. "The Arab world was offered a choice: to continue to fight and collapse, which the US is pushing for, or to take the path of participation in international projects that will ensure development and growth." The professor underscored that the Chinese economy remains one of the largest in the world. In 2016 the IMF and World Bank named China the world's biggest economy in terms of Purchasing Power Parity (PPP). In 2017 the People's Republic of China was ranked the second global economy in terms of GDP. "Therefore, a big economic war has erupted between China and America," Kolotov opined. "Beijing understands that [its competitors] will throw a wrench into its works, thus it has taken preventive measures to protect its interests. It is looking for allies and is ready to pay them. To accomplish this task, various proposals and projects are being put forward for establishing cooperation and strategic relations." The Russian academic pointed out that the most of the oil produced in the Middle East goes to East Asia, Therefore, China needs stability in this region and will work on it, he explained. On July 10, the China-Arab States Cooperation Forum (CASCF) kicked off in Beijing. Representatives of 21 Arab states, as well as the Secretary General of the League of Arab States (LAS) Ahmed Abu Al-Gheit took part in the event. One of the major tasks of this event is to bolster interregional trade and economic cooperation within the framework of the Chinese government initiative One Belt, One Road. Addressing the gathering Chinese President Xi Jinping announced "the establishment of China-Arab states future-oriented strategic partnership of comprehensive cooperation and common development." During a joint press conference with Foreign Minister Adel bin Ahmed Al-Jubeir of Saudi Arabia and Secretary-General Ahmed Aboul Gheit of the Arab League, State Councilor and Foreign Minister Wang Yi dubbed the eighth CASCF ministerial summit "a meeting that creates history." 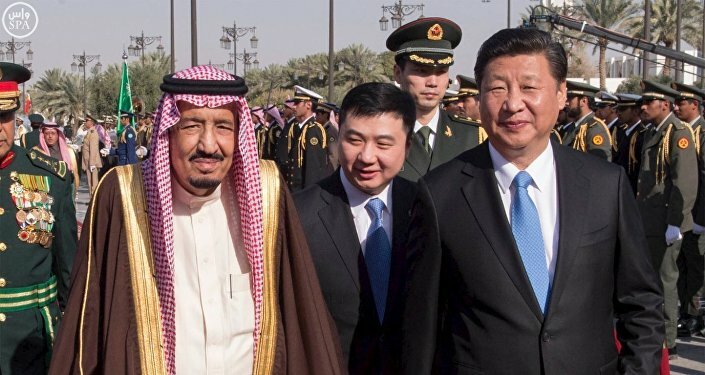 Beijing has put its words into actions by offering over $23 billion in loans and aid to Arab states, according to The South China Morning Post. Additionally, China has promised Syria, Jordan and Yemen $90.5 million in humanitarian aid. Speaking to Sputnik China on July 12, Wang Zhimin, director of the Center for Globalization and Modernization at China's Institute of Foreign Economy and Trade, stressed that Beijing is determined to bolster Sino-Arab economic cooperation within the framework of the Belt and Road initiative. "Our philosophy is this: 'jointly discuss, jointly build and share.' Cooperation between China and Arab countries does not inflict any economic harm on them being based on mutual benefits, overall gains, openness and inclusiveness," Wang highlighted.